Eileen is a co-founder of Therapy Dogs Nationwide. 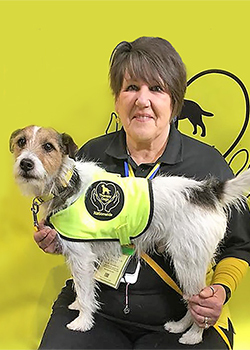 Therapy Dogs Nationwide all started by the chance remark during a conversation in January 2016, ‘Why don’t you start a charity of your own?’ Naturally, at that time Eileen laughed, however, the “seed was planted”! Eileen with the support of her husband Tony put their ideas to two close friends, and the rest, as they say, is history! Sadly, Tony passed away before Therapy Dogs Nationwide was established, and Eileen took a backseat for a while. Eileen has four dogs and can be seen on the Flyball circuit most weekends.